Personalized Maple Leaf House Number Sign - - leaf shape address sign. You won't find this unique personalized sign anywhere else. A Comfort House exclusive. Made in the USA. 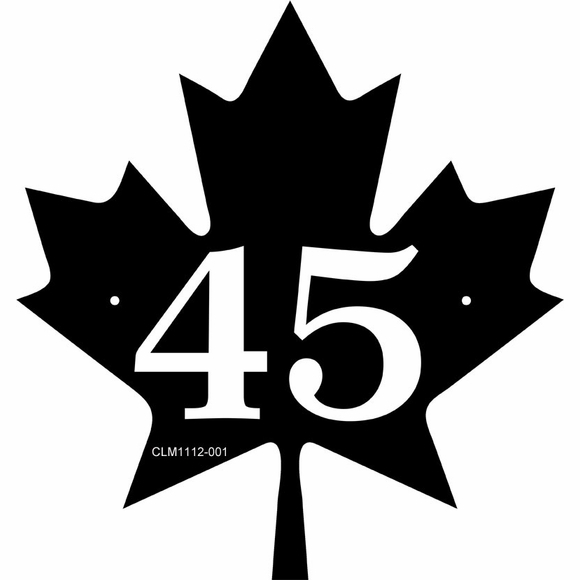 11.5"W x 12.25"H address sign handcrafted in the special shape of a maple leaf. Holds an address with one (1) 4" number or two (2) 3.5" numbers. Eight vivid color combinations: sky blue with white characters; black with white characters; white with black characters; brushed gold with black characters; brushed stainless with black characters; and kelley green with white characters; red with white characters; and yellow with black characters. Dimensions: 11.5"W x 12.25"H x 1/8". Personalized Maple Leaf House Number Sign. Leaf shape address sign. A Comfort House exclusive. Made in the USA.